Bicycling and clear bottom Kayak was OK, but the kayaking was a bit of a disappointment. This really should be poor. Bike tour was short but beach experience with bar service was great. We were supposed to bike and kayak but the water was too rough so we only did the bike part. Fantastic, fun way to see the little town! 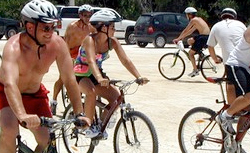 Included leopard truck,cool, tandem bikes, cool, cenote,cool,beach, cool, all fun! Bicycles were old and poorly maintained. Bicycles were old and poorly maintained. Tour guides were quiet. Didn&apos;t say anything or point out places of interest. Bike tires were flat making riding difficult. We took a bike and kayak tour with Andy and Carlos. We took a bike and kayak tour with Andy and Carlos. The terrain was very easy to ride and the kayaking to the coral was great, the boat had a clear bottom so you could see everything. Great experience. We rode single speed cruiser bikes from the dock to the kayaking location. I&apos;d assume about 3ish miles? Really enjoyed both the kayaks and the pedal bikes. Bikes did not have conventional brakes, you had to pedal backwards.